“My older child is in good health and learning well. 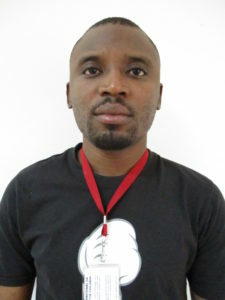 Also, I have got a healthy baby very recently who is 15 days old.” Ferdousi, age 26, tells us. She lives in Rayerbazar, a slum community of Dhaka city, with her family. Her husband Saddam, age 36, works as a day-labourer, meaning without a fixed income and hired in the short-term, while she tends to their home and two children. Her oldest son, Shahadat, is over two years old now. He and his mother joined Sponsorship under Bangladesh’s new programming, Maternal and Child Health, in 2015. Ferdousi with her children at their home in the slums of Rayerbazar. 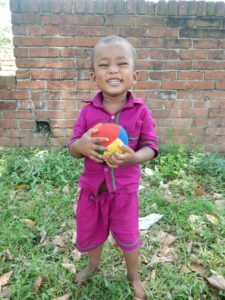 2 year-old Shahadat is very happy to play football (soccer) and be active outdoors. Even in addition to this, Save the Children also supports Ferdousi and her family by helping her track Shahadat’s height and weight to ensure he is getting the nutrients his growing body needs. Ferdousi adds, “I like Sponsorship support, because I learned to take care of my children to grow with good health and learning.” Their little baby Sazzad, a boy just a couple weeks old, has already benefited in the extra care Ferdousi took during her pregnancy. This family of four, Ferdousi, Saddam and the two boys Shahadat and little Sazzad, send their love and thanks to our sponsors of Bangladesh. Thank you, from the bottom of our hearts, for your support! Have you ever wondered what a true champion looks like? Perhaps you already know more than one and you haven’t realized it yet. We’re talking about the extraordinary people who decide to make a difference in the life of a child in need: our sponsors! 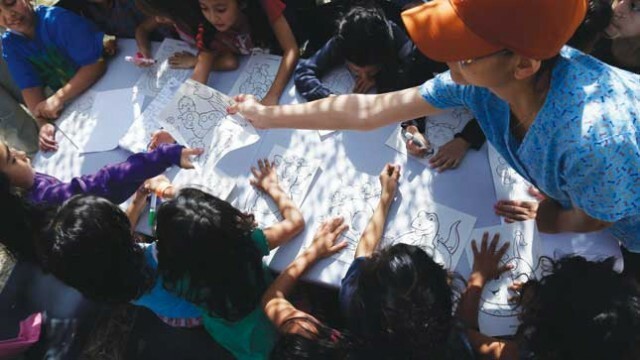 They not only support Save the Children’s programs around the world, but they commit to a longtime friendship with a child and his or her family. 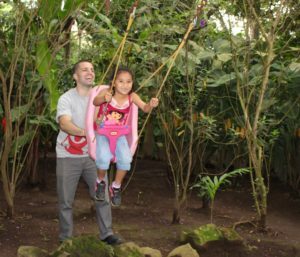 As said by one of our sponsors, Joey, “The feeling is indescribable, one that cannot be put into words.” For 3 years Joey has been sponsoring a 6-year-old girl in El Salvador, and he recently shared in a life-changing experience when he met her for the first time. Karla was shy at first, but finally made a connection by playing and doing fun activities together. When I laid eyes on Karla for the first time I had butterflies. I felt so incredibly happy to see this beautiful little girl with whom I’ve been in contact with for years. It was a moment I will forever cherish and always remember. Participating in a Sponsorship programs visit opened my eyes to exactly how much work and effort Save the Children puts into providing a better future for children in need. I was pleasantly surprised to see how well Save the Children seemed to partner with government entities and other local institutions, such as the community health clinic, in making sure the children were being well taken care of. I feel that Sponsorship really does so much more for children compared to many other organizations out there. 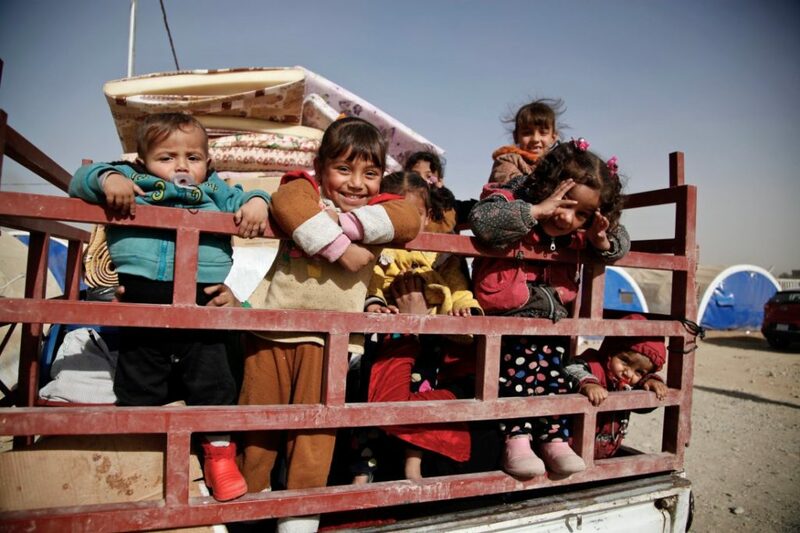 Save the Children uses its resources in a variety of ways to help children receive the necessities of life, such as healthcare and education. They are also big on taking into account children’s rights and safety – which I am a firm believer in. It is thanks to this organization that countless children’s lives are being saved. Joey and Karla with her mom, dad and sister posing to have a memory of a great day. To all the sponsors out there, if you can make the time to travel to El Salvador, or where ever it is you sponsor, to meet your sponsored child, I encourage you to do so. Please do so. You and your sponsored child will never forget the experience. These children hardly ever get to put a face to the letters we send them, so actually coming out to see him or her will be a life changing event for both of you. My visit with Karla is one of the best things I took advantage of in my life. I definitely plan on seeing my sponsored child again and reliving this incredible experience. 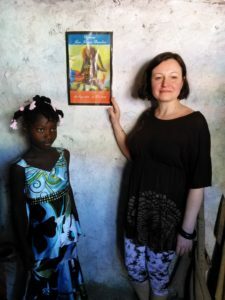 Have you ever thought about visiting your sponsored child? Contact our Sponsor Visits team via ChildVisits@savechildren.org today to get started on having a life-changing experience of your own! In Nacala-a-Velha, Mozambique, Sponsorship’s Adolescent Development program benefits 12,000 teenagers, aiming to help them develop practical knowledge about how to be prepared for adult life. Unfortunately, traditional practices in the communities where we work increase the likelihood of unplanned pregnancies in adolescents, which makes it hard, especially for girls, to continue their education. Girls in this part of the world, starting as young as 11 years old, are taught that to be productive members of their community their primary obligation is to have children and to care for their husband and their home. 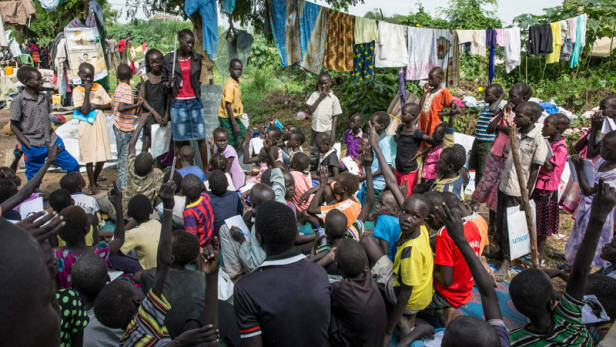 In order to mitigate these challenges, Sponsorship programs lead groups of adolescents and community members in activities that spread awareness on sexual and reproductive health skills, such as by discussing topics like contraception, family planning and the dangers of early pregnancy for girls. The goal of this programming is to reduce the high rate of unwanted pregnancies in these areas and to prevent the transmission of sexual diseases in adolescents. Awareness campaigns, radio broadcasted messages and theatre groups are among the strategies used. The radio broadcasts for example, spread awareness on how adolescent girls who become pregnant are forced out of school and cannot continue their education, which in turns hurts the development of the community as a whole. Teenage listeners are able to call in and discuss with adolescent peers participating in the radio programs topics they may be uncomfortable discussing face-to-face or with adults, like those regarding sexual and reproductive health. 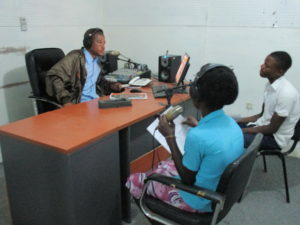 Adolescents sharing their messages on health over the community public radio. Adult community members, such as female teachers or doctors, also hold sessions to explain the benefits of withholding sexual activities until an older age to teenage female students, and act as role models – showing the girls it is possible to fulfill their dreams and ambitions. The community of Namalala, one located in Nacala-a-Velha, has a particularly high rate of early pregnancy. Here, Sponsorship is working hard to train teachers, school staff and healthcare providers on how to implement friendly adolescent services. Since starting our programs here, we have seen the community members join these efforts in a massive way, helping to organize weekly activities for adolescent students that encourage them to express themselves, for example through theatre or poetry readings. We’ve since seen early pregnancy rates go down, and likewise students’ dropout rates have significantly decreased. 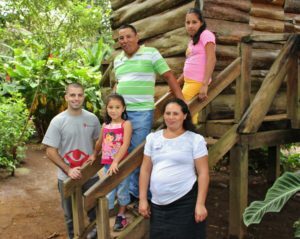 Osvaldo poses with adolescents who benefit from our programs. “Many of my friends had dropped out of school, but now we are informed that we should only marry when we [are] the proper age and after we finish our studies.” shares Ancha, an adolescent belonging to our Sponsorship programs in Namalala. Thanks to our sponsors, we are hopeful these trends will continue in Namalala, the wider area of Nacala-a-Velha and perhaps one day spreading throughout our country of Mozambique. We thank you for your partnership! What is it like when a sponsored child receives a letter? 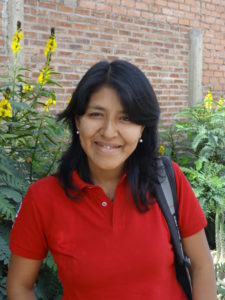 Hi, I’m Rosmery and I work as a Sponsorship Operations Assistant for Save the Children in Bolivia. 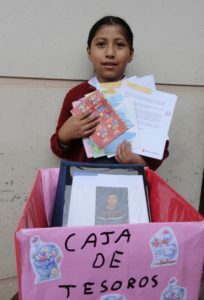 I am very lucky – every day at work I experience beautiful stories of children who receive letters from their sponsors. I want to share with you Jazmin’s story. She is a ten-year-old girl who has benefited from our Sponsorship programs, such as those that work to improve the quality of education at her school, since 2011. Today, I was able to visit Jazmin at her home in Cochabamba and give her a letter her sponsor had sent her. Rosmery will send Jazmin’s letter for her to her sponsor. As I watched her get ready to write back, I thought to myself, how would her sponsor feel if she could see her smile and gratitude? 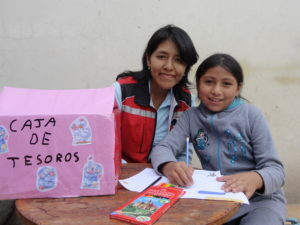 Does her sponsor also feel the same way when she reads Jazmin’s letters? Jazmin with her ‘treasure box’ full of letters, photos and small gifts. After she finished writing, Jazmin showed me all the letters she had received over the years, that she lovingly stores in the ‘treasure box’ she built, to keep her letters safe and with her. In one of her letters, her sponsor told her that she came to Bolivia and adopted a little Bolivian girl, just like her! She is all grown up now, and has 3 children of her own, Jazmin told me. We agreed that her sponsor must truly have a really big heart. For those of us working in Sponsorship, we hope that every sponsored girl and boy could receive notes from their sponsors, so that we are able to bring smiles to their little faces and have more stories like this one. There are still many people in the world who selflessly help children like Jazmin improve their self-esteem and gain access to a better quality education. We call those people our sponsors. The children call them their friends. We at Save the Children in Haiti always encourage sponsors to visit our programs in order to see first-hand how our work together changes the lives of Haiti’s children. We are always very excited and happy when we receive a request for a sponsor visit because we don’t get to host too many of them. When we do get to organize a visit, we do everything we can to ensure that both parties have an enjoyable and memorable experience. I wanted to share this story to show the impact a sponsor visit can have, in just a few short hours. Ten-year-old Love Dayana has been enrolled in Sponsorship since 2013, a year after Save the Children first began implementing Sponsorship programming in her community. 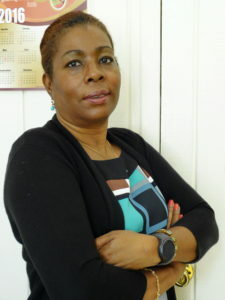 Her sponsor Daniela contacted us to let us know she was interested in visiting Love Dayana and seeing how our programs benefit children in Haiti in person. Love Dayana tells us that the visit that took place over just one day was the most exciting event that she had ever experienced. This was the first time in her life that someone she exchanges communications with from afar wanted to meet with her, face-to-face! She was thrilled at the opportunity to see her sponsor in person. Love Dayana and her sponsor, Daniela. As the day began, Love Dayana met and welcomed Daniela to her rural community, along with her mother and two Sponsorship staff members. Love Dayana acted quite shy, and from a distance but with a smile looked her sponsor over from head to toe. After they introduced themselves to each other, the unforgettable visit started. At first, Love Dayana’s mother did all the talking and she quietly but happily listened. Slowly, she became more open and friendly towards her sponsor. They exchanged some stories and discussed personal cultural values between the two different backgrounds. Love Dayana talked more and more, sharing about her school and her interests. They were able to hold lively conversations since Daniela knew some French, which also helped create a more relaxed atmosphere. Together they traveled around, visiting some sponsorship supported schools and local historical monuments. 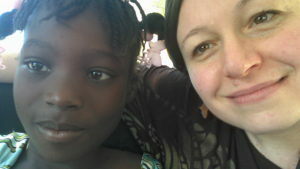 They ate lunch together – a special traditional Haitian cuisine that Daniela welcomed with pleasure. As the day winded down both were feeling emotional. Love Dayana was visibly comfortable and at ease, hugging her sponsor and holding her hand as they walked. As they said goodbye, she hugged Daniela again and thanked her for the visit, saying, “I hope you will come back again soon to see me,” and Daniela replied “Me too, I hope I can come back soon to see you again.” Love Dayana then asked her sponsor to use her cell phone to take a ‘selfie’ of them both together. Love Dayana and her sponsor, Daniela, taking a selfie. Love Dayana shared that she hopes that all the children enrolled in Sponsorship could have the same opportunity, that one day their sponsors will come to see them. “Since the day my sponsor left, I became very popular in my community because I am the first and only child who ever had a sponsor visit!” concluded Love Dayana proudly. She will carry this feeling of self-worth and confidence with her into school each day for long into the future. 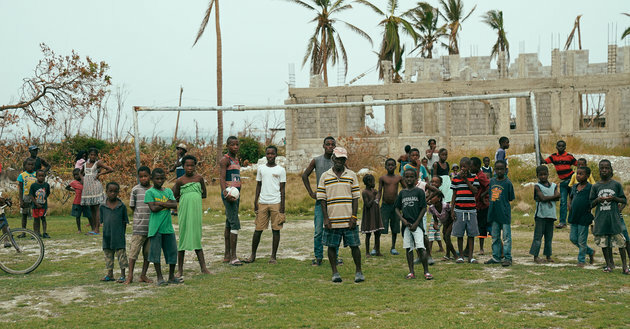 This was just the second sponsor visit that Save the Children in Haiti has hosted since the implementation of the Sponsorship program in Dessalines, back in January of 2012, so it was a great honor to be a part of it. To our dedicated sponsors, we thank you! Know that you are making a difference in these children’s lives every day. You are most welcome to come and visit Save the Children in Haiti for yourself. Seeing your sponsored child face-to-face is truly a wonderful and unforgettable experience! It would be our great pleasure to host you.